Visit Eileen's website, or follow her on Twitter or Facebook. Welcome, potential narrators! Several of you asked for more details on Twitter and Facebook, so here's where I explain how this whole ACX audiobook dealie works. Since I hold the audio rights to all my books except Shade, Shift, and Shine (excellent audiobooks of which are already available through Audible, iTunes, Amazon, etc. ), I can hire narrators myself. ACX is a marketplace site where authors and narrators find one another. Once we've produced the audiobook, it gets distributed by Audible/Amazon/iTunes. 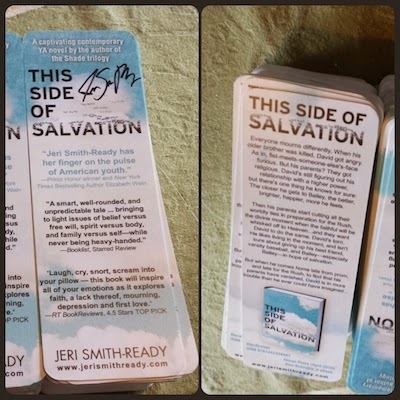 I add a book to the site, like I did for This Side of Salvation. I include a short excerpt to be read as an audition piece. A narrator "auditions" by recording themselves narrating the excerpt, then uploading the recording to the site. I listen to the audition, and if I like it, I make an offer. Since I'm pretty strapped for cash right now (okay, always), the narrator and I split the royalties, rather than me paying them upfront. If I make an offer and it's accepted by the narrator by 11:59pm Tuesday, the royalty rate will be 50% (but can escalate up to 90% depending how many books are sold). However, any offers accepted as of March 12 or later will earn a flat royalty rate of 40%, which means the narrator and I each get 20%, no matter how many books are sold. I've been meaning to do this for years now, but the upcoming royalty rate change kind of lit a fire under me, and I figured "Why not?" It's a chance for me and a narrator to make a little money without spending any, and a chance for readers to finally get audio versions of these books. Check out ACX's How It Works page for more details. And if you're interested in auditioning (preferably by Tuesday morning), simply create a narrator profile, then click on one or more of these titles to audition. Good luck! 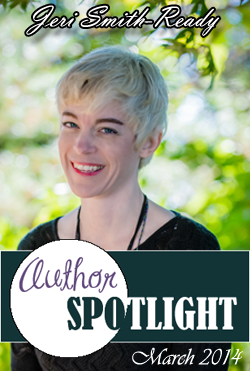 The fantastic book bloggers at Step Into Fiction invited me to be their spotlight author for the month of March! I'm so excited to be taking part in their monthly feature. Please visit and show them some love! 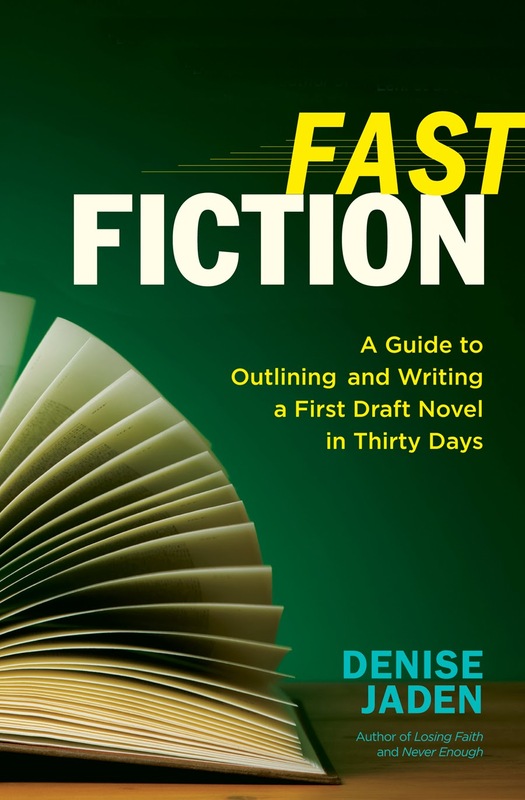 Learn the RIGHT way to fast draft with Denise Jaden's FAST FICTION (and win some awesome books)! I'm especially thrilled to introduce Denise Jaden's new book, FAST FICTION, because I'm reading it now! I've never had much luck with fast-drafting (usually defined as writing a novel in a month or less), but when Denise told me she had written a book on the subject, I decided to give it one more shot and maybe this time, oh, I don't know, get HELP instead of trying to figure it all out on my own? Two pages into FAST FICTION, I discovered where I went wrong: I DIDN'T PLAN ahead of time. I would leap in and start writing frantically the moment I was struck with an irresistible idea. It was the equivalent of hopping into a car spur of the moment to drive to "I Don't Know--Somewhere Cool!" Because getting there is half the fun, right? I would change the destination (plot) on a whim as I went. My travel companions started off as total strangers to me and each other (didn't have a handle on my main characters for the first 25-30K words). I didn't bring enough money for food or gas (tried to fast-draft during a month with lots of prior commitments). I had no map (nothing but the vaguest outline, which was thoroughly untested for logic)! I didn't understand the terrain (no time for research, which left huge gaps in the book and led me down unrealistic plot paths). I became obsessed with distance traveled (wordcount), regardless of whether it was in the right direction. By that point, I knew the book had major problems, so racking up words was the only thing I had to feel good about. The one time I actually succeeded in writing 50K words in one month (a New Adult novel last August), the result was a disaster. Just this week I brainstormed ways to fix it and realized it would take much less time and energy to start something new. So I abandoned the project. Which is a shame, because it was a book that meant a lot to me. It might've rocked your socks off. But I killed it with my stubborn devotion to an unrealistic goal. Sorry. Here's the part where I go all ALL-CAPS-Y ON Y'ALL. DON'T DO WHAT I DID. 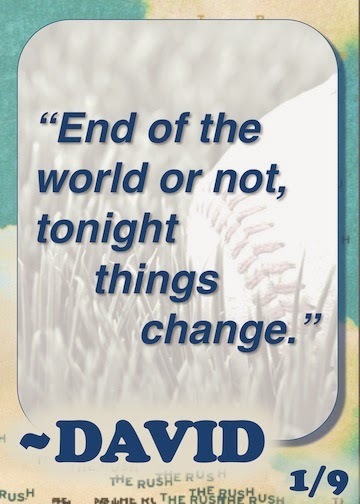 If you want to try NaNoWriMo or Camp NaNoWriMo, or do your own fast-drafting at a time convenient to you, I highly recommend picking up Denise Jaden's FAST FICTION at least SIX WEEKS before sitting down to write. She lays out a simple but thorough pre-writing plan that even an easily distracted, impulsive brain like mine can follow. And during the drafting period, she has a tip and inspiration to follow each day. Because without a plan, you will waste gas, time, and energy. 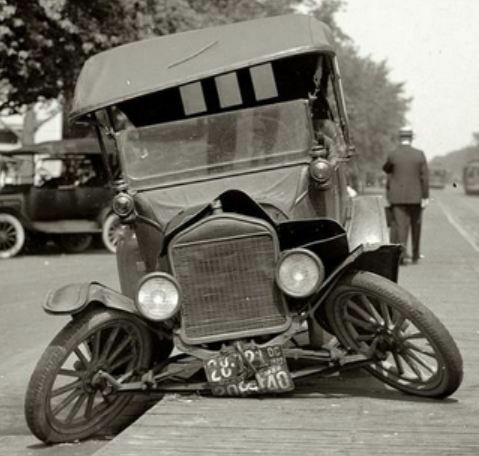 You might even damage your car (manuscript) beyond repair. DO NOT TOTAL YOUR BOOK. It deserves better. So without further ado, here's Denise to talk about FAST FICTION! Denise's Fast Fiction Tip: Use Personal Heroes! Who are your personal heroes? And, more importantly, why are they heroic to you? The heroic qualities which are most important to you will always evoke passion within you. That’s why we tend to love to watch movies or read books with a certain type of characters. Do you gravitate to characters who are selfless or extremely talented? Keep these heroic qualities in mind as you develop your own plots and characters. Finding what makes us passionate about our characters can help carry us through as we motivate ourselves to tell their most important stories. 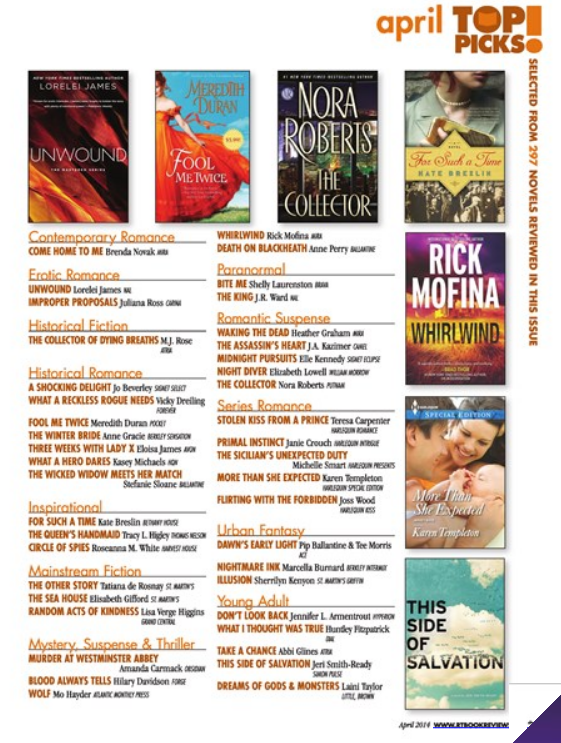 Starred Review from Booklist for This Side of Salvation! This one's been burning up my inbox for almost a month, since I had to wait until Booklist's publication date to share it. Now that day has arrived, with one month to go until This Side of Salvation's release! Kirkus and Publishers Weekly have already weighed in with 100% positive reviews (I used my special author superpowers to read between the lines for anything negative), so TSOS is 3 for 3 so far when it comes to the major review publications. None of my previous novels have even been reviewed by more than two of these journals at once, so this is a major milestone for me. I love how he describes the Cooper family's unraveling as a "slow-motion train wreck." Sadly, that's often the way it is with families when they don't get the help they need to cope with tragedy. The part I italicized made me do a little dance, especially the "spirit versus body" part. It took me back to when I was writing TSOS and listening to Arcade Fire's Neon Bible album EVERY. SINGLE. DAY. When it got to the last song, "My Body is a Cage," I would think about David's internal war between his physical and spiritual desires. It wasn't the stereotypical religious kid's black-and-white choice where he felt he had to remain physically or sexually "pure" to get into heaven. It was broader than that, as he tried to figure out what it meant to be in the world but not of the world. Anyway, these philosophical issues are always percolating in my head while I'm writing, but it's hard to not to lose sight of them while trying to create a gripping story. It's nice to know that some of the stuff in my brain actually made it onto the page, stayed there through every draft and edit, then clicked with someone else's consciousness.